The two countries have distinctly different approaches to doing business. It’s not uncommon for Russians to misunderstand how the Japanese do business. Some of us feel that the Japanese method of negotiation is like a ceremony that only descendants of descendants of samurais can understand. I personally decided to try and comprehend the Japanese style of doing business and it helped me even understand the Russian business mentality better. My Japanese husband does business with a few companies from Russia. Over cups of evening tea, we often discuss the differences in business etiquette in our countries. During such discussions, I feel as if I were a tiny bridge linking two different islands. The islands are just different; neither is better than the other. Here are five key areas where Japanese and Russians differ in their approach to business. In Japan, “being on time” means you should arrive 15 minutes in advance. 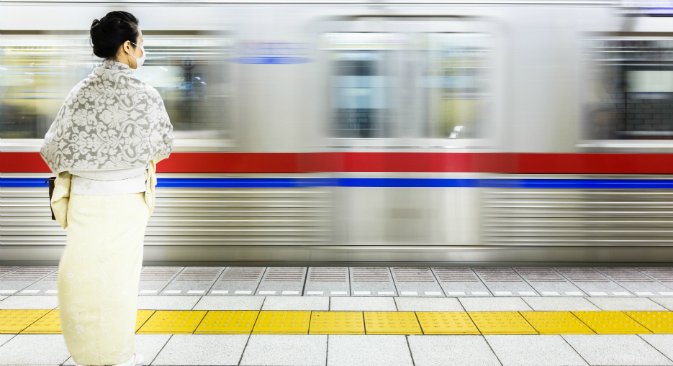 Even top managers take the underground in Japan, as it is the most reliable form of transport. Employees register their time of arrival at work by swiping their access cards. Turning up at work just a few minutes before the official time is considered being late. With such an attitude towards being punctual and early, Japanese businessmen are shocked when their potential partners from Russia are late for talks. “We waited for the CEO of a big Russian company for more than an hour,” a managing director of one of the leading Japanese pharmaceutical companies once told me, expressing horror. I had to explain to the Japanese executive that tardiness by top management officials in Russia is sometimes even welcomed. This is seen as a way of taking additional time to ponder over the decisions that need to be taken. In Russia, being late is sometimes considered a way of showing importance, and being early is seen as a form of subordination. The second shock for the Japanese may be what they perceive as impudence or tactlessness. Every word the Japanese say, especially when it comes to work, is carefully weighed. Experienced interpreters keep this in mind when translating. Russians and Japanese tend to have different outlooks when it comes to loyalty. Japanese people usually choose one job and one company for their entire professional life. They will work there until retirement, and this only can be altered by some emergency, like a tsunami. Russians have a more pragmatic approach towards their career. The president of a famous Japanese cosmetics company narrated an incident that shocked him. After his company signed a contract with a Russian distributor, he received many calls from its competitors to use their services. The Japanese businessman was firm about not using other distributors. Japanese companies have a more democratic approach when it comes to making decisions. They value opinions across the board. I remember a case when a Russian company declined to sign a contract with its Japanese counterpart as the latter took three months to come to a decision. The Japanese company wanted the opinion of its executives from all its branches in Japan. For the Russians, such a long delay felt like torture. In this particular case, when the Japanese businessmen called their counterparts in Moscow to tell them the good news, they were told that the Russian company had already found a new partner. Japanese companies always seek an intermediary who will act as a guarantor in a business transaction. The guarantor is usually a respected member of society or a reputed organization. This mediator is an invaluable part of doing business in Japan and nothing is done without him. Russian companies try to do business directly since they believe that the middleman eats into the profits. Despite these huge differences, there are many cases of mutually profitable and successful business ventures between the two countries.